Here we go again, folks, with another soundboard from the FTD label. This time with the focus on Elvis' 12th season in Las Vegas (March 18th - April 1st 1975) and actually, it's not bad at all! This latest FTD release gives us a complete 1975 Vegas concert, plus a handful of bonus tracks. But before we start looking at the performances included here, let's get the date of the main show right: This is NOT the dinner show from March 30th as claimed on the cover. It is in fact the midnight show of March 28th 1975. How do we know that? Well, on March 28th Barbra Streisand attended the midnight show, and Elvis introduced her from the stage. It's all here on tape. Streisand joined Elvis backstage after the show to offer him a role in A Star Is Born. Peter Guralnick and Ernst Jorgensen confirm the date and the facts in their book "Elvis - day by day". Why then, would the same Jorgensen mix up the dates this time? I really don't know. By the way, I've just been told that Ernst Jorgensen is aware of the mistake by now, and has admitted to the date on the cover being wrong. So, let's not pick on this any further. Let's get down to business! Also Sprach Zarathustra has to be the ultimate opener! But here it sounds out of balance. The horns are way back there, and James Burton dominates the overall sound with his licks and fills during this dramatic intro. Ronnie Tutt's drum roll sounds like someone beating on cardboard boxes... and then it's straight in to the cool rockin' riff of See See Rider. Here comes Elvis! Er...where? Oh, there he is! The first couple of lines are barely audible, but the sound picks up after a while. In fact, the overall sound picks up, and for a soundboard recording this is not bad at all! Elvis seems a little strained during this first song, all though he puts quite a bit of energy into it. Well, well, well... I Got A Woman/Amen follows with all the usual routine we've had so many times, the shaking of the leg, the JD landing of a plane...Our man introduces himself as Ann-Margret, and then there's a short dialog between him an a woman who sounds like some cartoon character. The Fats Domino-styled Love Me has never been a favorite of mine, but there's a bit of interaction with the audience here, and E gives it a powerful ending. If You Love Me (Let Me Know) is performed with a strong voice. And I Love You So was a new song for Elvis in March 1975, recorded just weeks before this beautiful performance. A welcome new addition to his set! The CD title - Big Boss Man - follows. Ronnie Tutt slips out of his cage and almost overdoes it with all his fills and rolls. Actually, I don't care much for the 70's version of this song. It lacks all the cool aggressiveness from Elvis' 1967 recording. Though quite energetic, it feels a bit fussy. It's Midnight is as melodramatic as they come. Elvis seems to put a lot of feeling in to it, and I've yet to hear a bad performance of this song. The rarely performed Promised Land follows. This is straightforward Chuck Berry rock'n'roll, and it works quite well, although the musicians have to struggle to keep it together on some parts. Elvis announces the next song as "rough", only to ask the audience what they want to hear. It's a choice between Burnin' Love, Tryin' To Get To You and Fever. He goes for Burning Love. Good choice, good song! Elvis is a little short on breath during the last verses, but it's almost word perfect. Then follows the part that I personally find way too tedious: Introductions, over 8 minutes of them to be precise. Or to put it like this: over 8 minutes for Elvis to get a break and catch his breath. By the way, this was Duke Bardwell's last season as Elvis' bass player, and although he never could match Jerry Scheff, you'll find that he sounds a lot more confident here than he did during the tours of '74. After several solos and the introduction of Barbra Streisand, we get a strong version of My Boy, another one of those melodramatic songs that Elvis loved so much, assumedly because they reflected his own situation of life at the time. During I'll Remember You Elvis fools around with the audience, and though it partly destroys the song, it's good to hear him having fun. Let Me Be There has never been a favorite of mine, but Elvis seemed to like it, so... Here he puts quite a bit of energy into it, and we get the usual reprise too. Hound Dog is a waste, a little more than a novelty piece. Then follows An American Trilogy, and again we get to enjoy the power of the Presley voice. Unsurprisingly the show ends with Can't Help Falling In Love and a very fast fade before the closing vamp. Then there are the eight bonus tracks. The first five are said to be from the midnight show March 31st. Here's what you get: You Don't Have To Say You Love Me - done a little faster than we are used to from the early 70s. Well sung though! The Wonder Of You is one of very few live songs that I just can't handle. My ears find it downright boring! Elvis laughs away a couple of words, but it's not enough to make the song entertaining. Bridge Over Troubled Water is much better. No fooling around, no vocal shortcuts. Strong! After three false starts Little Darlin' gets going. It's a mess, and Elvis knows it! Actually, I've never heard it work once for our man. Hawaiian Wedding Song is a pretty little song without much depth to it, performed well with a smile. The last three bonus tracks are presumed to be from the midnight show on March 22nd. We've had a couple of them before. Green, Green Grass Of Home is as far as I can hear the same we had on the Live in Las Vegas box set. So is You're The Reason I'm Living. Fairytale was new to my ears. On these three last tracks, the sound drops in quality. There you have it! 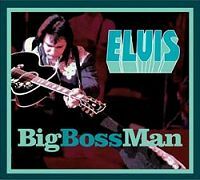 Big Boss Man gives us the 40-year-old King Elvis in strong voice and high spirit. Not yet the heavy breathing giggler we know from the summer tours of the same year. What this soundboard recording - as almost every soundboard recordings - lack in atmosphere and audience reaction (they are barely audible), it gains from the joy of hearing Elvis enjoy himself. It's not an essential performance, but it's good. It doesn't give you any surprises, but if you're a fan and a collector of EP concerts, your listening pleasure is guaranteed. Big Boss Man is another welcome addition to the FTD catalogue.